Louise Pomeroy Inches (1861–1933) was born in Troy, Pennsylvania, the youngest of three daughters of Horace and Emma Pomeroy. When she was twenty-two, she married Dr. Charles Inches of Boston, a Harvard-educated physician twenty years her senior, who become known for giving free medical aid to the poor. At the time she sat for her portrait, Louise Inches was a prominent society hostess well known for her beauty and the mother of two young sons. She was pregnant with her third child when she posed for Sargent, wearing a fashionably daring red evening gown that had been made with detachable panels to accommodate her pregnancies. (The garment, which still survives in a private collection, is an American copy of a design by the French couturier Worth.) Apparently the artist and sitter enjoyed each other’s company; both were accomplished musicians and are said to have played piano duets together. Sargent concentrated his attention on his sitter’s face and elegantly attenuated neck, painting her dress and arms more quickly and sketchily. The three-quarter length format, blank background, and slightly turned pose suggest French eighteenth-century portraits, which Sargent—and many of his patrons—admired. This reference is enhanced by the original frame selected for this painting, a decorative eighteenth-century style gilt frame crowned by an elaborate three-dimensional ribbon. 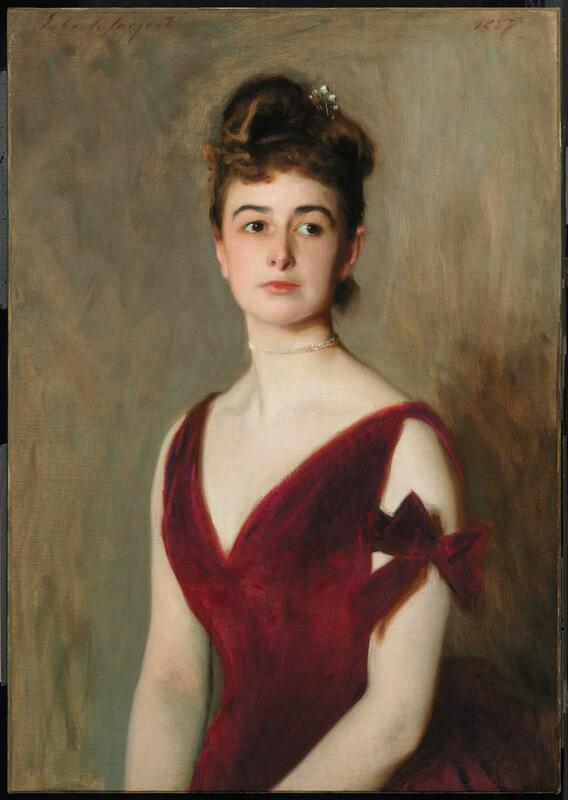 The aristocratic fashionability of Sargent’s Boston portraits, including Mrs. Inches, was praised in the local press when they were first exhibited at the St. Botolph Club, in Sargent’s first solo exhibition, early in 1888. The critic for the Boston Evening Traveller declared that this portrait was “one of the most brilliant pieces of coloring that has been painted since the days of Titian.” Writer Susan Hale noted, however, that many onlookers were “furious at the want of justice done to their friends … between those who thought them too beautiful and those who thought them not beautiful enough, all just speculation of [Sargent’s] method and execution was lost.” Many viewers gossiped about their peer: “I think Mrs. Inches looks as if she would bring you the head of Holofernes for the asking,” Fanny Lang wrote astringently to Isabella Stewart Gardner. Mrs. Inches often made the painting available for loan, although Sargent advised against asking for it again for a 1924 exhibition, as “[Mrs. Inches] rather makes a condition about my going to see if there is not something wrong about her nose—& I haven’t time.” Despite such criticisms, Sargent’s image of Louise Inches projects both virtue and style. Her demure gaze and pose contrast with her brilliant crimson evening gown with its daring décolletage. In this way, she personifies the bold innocence that contemporary writers, including Sargent’s friend Henry James, found peculiarly American. 1. Henry James, “John S. Sargent,” Harper’s New Monthly Magazine 75 (October 1887), 683–92. 2. Edward Boit, diary, roll 83, frame 1746, Archives of American Art, Smithsonian Institution, Washington, D.C.
3. Boston Evening Traveller, February, 8, 1888. 4. Boston Sunday Globe, February 19, 1888. 5. Fanny Lang to Isabella Stewart Gardner, January 30, 1888, Isabella Stewart Gardner Museum Archives, Boston. 6. Sargent to Walter Clark, January 26, 1924, Grand Central Art GalleriesArchive, quoted in Richard Ormond and Elaine Kilmurray, John Singer Sargent: The Early Portraits (New Haven: Yale University Press, 1998), 202–3. This text was adapted from Erica E. Hirshler’s entry in John Singer Sargent, ed. Elaine Kilmurray and Richard Ormond, exh. cat. (Princeton, N.J.: Princeton University Press, 1998).